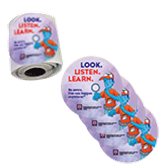 Stickers maximize the impact of Fire Prevention Week™ messaging on kids! Bright and colorful FPW Stickers are a perennial favorite promotional item for visiting schools, camps, daycares, and youth groups. The ability to stick a vital safety message virtually anywhere empowers children to have a positive impact on educating their community. Few prizes are as economical or effective at educating children on lifesaving concepts as FPW Stickers. Kids love to put them on backpacks, lunch boxes, lockers, scooters, bikes, and in other high-visibility places.